Mastercard M-TIP and NIV test cards for certification of PayPass Magstripe terminals and validation of PayPass Magstripe profiles over the Mastercard network interface. Subset 6C is either used to perform M-TIP Contactless certification of PayPass Magtripe terminals or to perform validation of PayPass Magstripe profile over the Mastercard network interface. 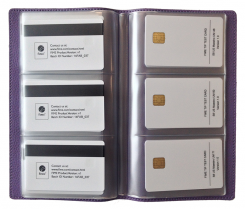 Subset 6C is also used with Subset 8M to perform M-TIP Contactless certification of PayPass M/Chip terminals. For contactless terminals implementing the US Maestro AID, Subset 8 USM is additionally required. Subset 6C is a Mastercard Qualified NIV and M-TIP Test Tool. It can be used with any type of contactless terminal, POS and ATM. The card-terminal transaction logs are simply retrieved using card log software and a PC/SC reader.